I’m so excited to continue reading a LOT in 2016! 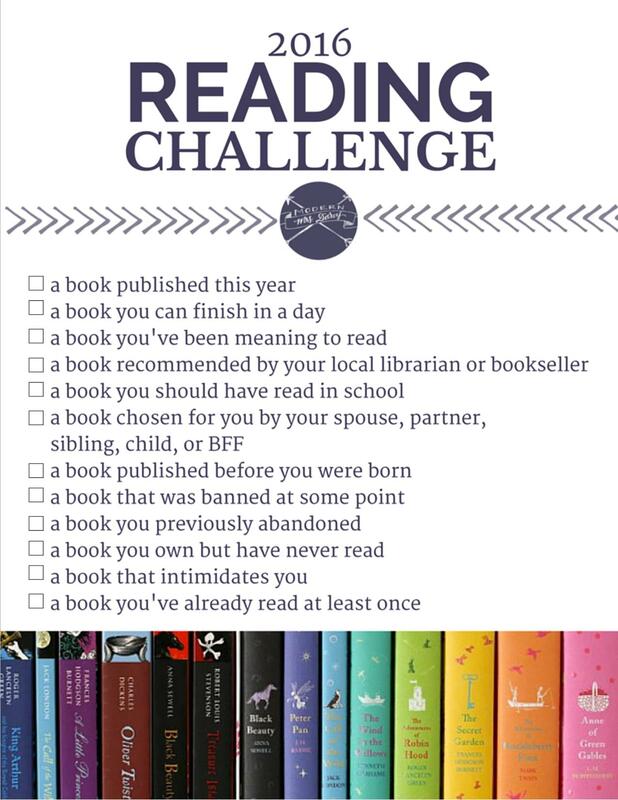 You may have seen this awesome 2016 reading challenge because it’s been all over social media these past few weeks. A bunch of my friends and I are going to tackle this together this year. Want to join us? Below are my picks for each category. I have to say, it was harder to do this than I thought it would be mostly because many of the books I want to read fit in a few different categories. I’m really excited about my picks though because sometimes I struggle with figuring out what to read next. Now, when I’m not sure what I’m in the mood for, I can check out my list and get to it. And, I it will be fun to revisit this list At the end of the year and we’ll see how it went! As always, the titles are hyperlinked so you can just purchase from Amazon if any of them sound good to you! I love Chris Bohjalian so when I heard that his new one was being published this year I was 100% in. It was published on Jan 5th and I think I’m going to save it for when we go on vacation in February. I love having an amazing book to read when we’re away. This category was hard for me because, let’s be honest, when do moms have time to just sit and read all day? I did a bunch of googling looking for a short book. I’ve never read Breakfast At Tiffany’s (and I’ve never seen the movie either) and I’d like to do both. Now’s my chance! Since I haven’t been to the adult area in the library in about 5 years this required some creativity on my part. (I do most of the borrowing of books via our public library’s website. They have an amazing selection of ebooks I can borrow and read on my Kindle without ever leaving my couch). I do, however, get People magazine thanks to a fundraiser at Gia’s school and they have a Books page where they recommend books. One More Day was one of them and it’s sounds really good. So, this will have to count as recommended to me. This one was really hard for me to come up with for several reasons. First of all, I was an English major in college and I have an English Education masters degree. Annnnd, I taught high school English for 10+ years, so many of the books I didn’t read in high school, college or grad school, I DID read when I taught. But I’ve always wanted to read The Giver, so this is the year I’m going to do it! My husband and I are big fans of GMA and we’ve talked about Dan Harris’s book before so when he suggested this one I was excited. I’m not a huge non-fiction reader (unless it’s an autobiography. I’m a sucker for autobiographies about famous people) but I’m looking forward to having at least 1 on my list for this year. Again I turned to google to help me come up with a book I actually wanted to read that was published before I was born. I chose this one because I remember my mom reading it when I was little and I remember her telling me about it. It’s the first in a series though and that could mean I have to read all of them if I get hooked! Books aren’t truly banned anymore (not in this country anyway), but the American Library association does keep track of books that are frequently challenged by the public. The Perks of Being a Wallflower made the top 10 challenged books list a few years in a row. And I feel like it’s a bit f a cult classic that I want to be in on. This was the only easy one. About 10 years ago I started reading East of Eden by John Steinbeck and loved it. But it’s a long one and I remember reading it while I was teaching full time. Life got busy and I put it down for too long. When I went back to it too much time had passed and I couldn’t get back into it. And it’s too long to just start over. So I chucked it. But this year, I WILL get back to it and I WILL finish it! I have no idea where I got this book, but I found it a few days ago when I was cleaning out our basement (working on de-cluttering in 2016). It sounds adorable and I’m looking forward to reading it. I’m not really sure why this one intimidates me but it does. Maybe it’s because it won the Pulitzer. Maybe it’s because it’s 760 pages. I’m not going to worry about it though because the reviews promise “cruelly beautiful passages” and I’m a total sucker for beautiful prose. John Green is probbaly most famous for his young adult books The Fault in Our Stars and Paper Towns (which were both made into movies). But before either of those there was Looking for Alaska. I’m not sure how I came to own this book but I read it over the summer in 2007 and I was totally captivated. In my opinion it’s Green’s best novel. So it you read the others and like them, give this one a chance. You will NOT be disappointed. Great challenge! I haven’t read as much as I’d like since having little ones. I’m lucky if I get 2 books done a year and usually it’s when we go on vacation. What is your favorite book of all time? Oh my–that is hard question! I have a bunch of favorites but I’d say the TOP one is The Great Gastby. If we’re taking fun books, I LOVED Something Borrowed and Something Blue by Emily Giffin. Love this! I will have to check these out! I am trying to read 2 new books a month.. pinned this so I dont forget your picks! I shouldn’t have read this!! First, I hadn’t seen the list and that’s such a fun way to set your book goals. Secondly, now I have more books I want to read. Especially in the bonus list, the guy writes about his year in Italy writing and then there’s the book he wrote as well. Wow! Traci I totally agree. I’ve heard of “All the Light We Cannot See” and I wasn’t dying to read it, till I found the non-fiction book by the author. Now I can’t wait to read both back to back!! ooh! definitely pinning this. i’m always looking for something new to read and these are some great picks. I just finished Room and LOVED it. I read it in a single day, which is very unusual for me! Can’t wait to see the movie now. I love this challenge!! I am printing it out now so I can write my list of books!! I love your choices! What a fun reading challenge. What a great list. The Giver was one of my favorites. I like this idea, I really need to get into reading books again.